My twenty-seventh entry to Norms Thursday Doors. Doors with a history. But. This door is no door at all … Sorry! I developed the image (digital processing is also developing. Sort of anyway) made the post and published it. And then realised: this is no door. It’s a gate. 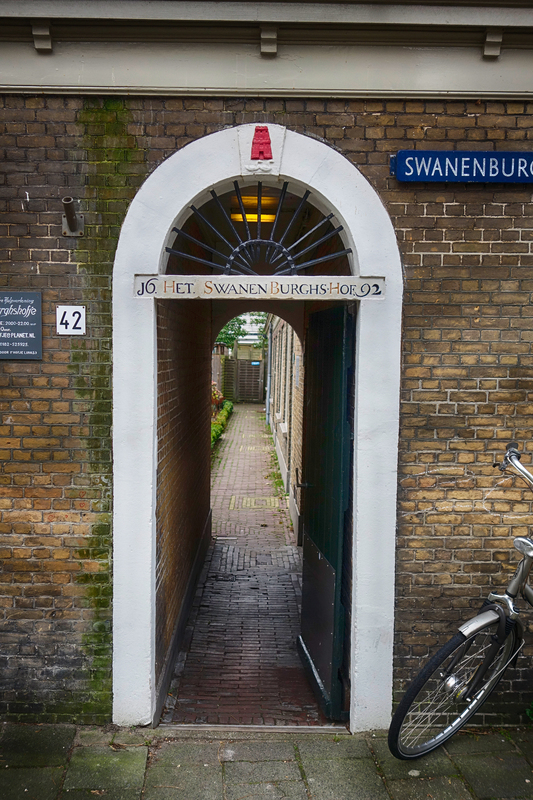 But a very old gate and access to a lot of doors because a ‘Hofje’ is an enclosed living community. Founded in 1692. So for this week I stick to it 🙂 You have to believe me on the hugh amount of doors inside. It is not appreciated to make pictures inside. A doorway with any sort of door or gate works and remember, some of us have stretched the “rules” even farther than this. It’s lovely. Deuren en hofjes blijven mooi fotomateriaal geven. I love these little arched entrance-ways leading into an interior courtyard. The open gate looks so welcoming. Too bad they frown upon taking photographs. It might not be a door but I kind of like it so that’s ok!! Somehow it sounds familiar (remember I’m Dutch), but I can’t place the location! My guess is people still live here? love the old look:) Have a great weekend! It’s a lovely arched entrance and we can just about see where some of those doors are. I love the coat of arms on the top, with the swans. Very nice. A gate, a door…it’s all good 🙂 and I love that brick pathway too. Nice choice, thanks for sharing it!